The granny square is a classic pattern that provides infinite variations when you change the colors, the number of stitches or the size. While veteran crocheters love the versatility of the granny square, beginning stitchers find that these timeless squares provide a fun and easy way to learn the basics of crochet. Most granny square patterns incorporate chain, single and double crochet stitches, so that by the time you’ve finished a square, you’ve learned many of the skills you need to tackle more complicated projects. The first thing you need to know about granny squares is that most of them start with a circle, which can seem a bit confusing at first. Most patterns start with several chain stitches, which you join into a circle before adding more stitches to create the square shape. This beginning circle leaves a small hole at the center of each granny square. If you don’t care for the look of this center hole, you can start your squares with the magic ring technique, which lets you tighten the starting circle to create a completely closed center. 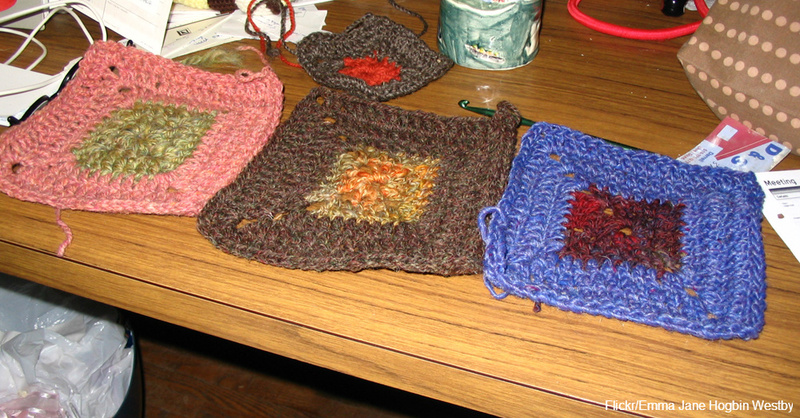 Granny squares are worked in multiple rounds, and you can use the same color for the entire square, or you can change colors with each new round. Because each round uses only a small amount of yarn, the squares are an ideal way to use up small amounts of scrap yarn you have left from other projects, recommends The Crochet Crowd. In addition to learning new stitches, beginning stitchers can use granny squares to perfect their tension for a consistent gauge. Most squares use chain stitches to separate the other groups of stitches, and working these chains repeatedly throughout a square helps a new stitcher learn to crochet more loosely or more tightly so that the square maintains its structure. While many stitchers think of granny squares as part of a bed-size blanket, you can make the squares in any size and turn them into just about any apparel or home decor project, including scarves, purses or pillows. For a versatile square that you can make as small or as large as you want, check out the never-ending granny square pattern.